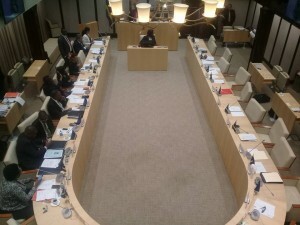 WILLEMSTAD – Yesterday during the Parliamentary debate on the local aviation company InselAir, the Members of Parliament were divided on their opinion of what should have happened or what the government’s response should have been with the airline. The coalition MPs and the opposition MPs were fierce against each other. Gerrit Schotte, as a spokesman for the coalition, said that the bridging loan of 33 million guilders was a waste of money, while the opposition MPs believes that without the government support the airline would have gone bankrupt. Schotte presented documents showing that InselAir has a debt of more than 30 million guilders. The company owes insurance premiums, pensions and taxes. Schotte wants the remainder of the loan, more than seven million guilders to be transferred to the pension funds. From the opposition side, Marilyn Alcala-Walle responded saying that it hurts to see how a group of MPs are frustrating the negotiations with the shareholders of the Colombian airline, Avianca and putting InselAir at risk. If the coalition MPs continue, the company will not only lay off 250 people but the other 400 too. Also, other companies that depend on InselAir will suffer the consequences of the bankruptcy of the airline. Curaçao will then lose much of its air links and would affect the economy ten times more than the 33 million guilders loan the government has assisted InselAir with.